Lauren Kahn is an educational consultant located in Austin, TX and helps families find colleges and school placements for students throughout the country. Who is gaining preferred admission status to the Ivy League Schools and the other elite schools? So by now you’ve figured out that Ivy League schools are admitting some infinitesimally small percentage of students who apply. These students are truly the needle in the haystack of college-bound applicants. Who are they? And what exactly have they done to get in the front door of the hallowed halls of this nation’s most selective colleges? First, a definition-There are 8 Ivy League Schools (Brown, Columbia, Cornell, Dartmouth, Harvard, Penn, Princeton and Yale). It is not their selectivity or prestige that initially brought this group together as the “Ivy” League. It was football. That’s right, the Ivy League was an early athletic conference that has, in fact, evolved into a collection of this country’s most selective colleges and universities. There are schools that are as difficult (or almost as difficult) to get into as the Ivy League schools, but we cannot neatly amass them into one plant-like athletic conference the way we can with the Ivies. This “Ivy-esque” group includes schools like (but not limited to) Duke, Stanford, Georgetown, MIT, Rice, Johns Hopkins, University of Chicago, Williams, Swarthmore, Middlebury and Amherst, just to name a few. In some cases, some of the schools who are not part of the original athletic conference, admit fewer students than those who were in the founding group. In this country, however, there is a fixation on attending the eight institutions in the Ivy League, but that’s much easier said than done. Consider these stats: Brown University received almost 29,000 applications for about 2,600 spots for an admit rate of 9.2%. Cornell University received over 40,000 applications for just over 6,000 offers of admission. Dartmouth admitted 10% of their 22,500 applicants, included in that 10% are 39.4% who are valedictorians of their high school classes. Harvard sent out 2,029 offers of admission. That’s 5.8 percent of the 35,023 who applied. Princeton said it had offered admission to 7.3 percent of almost 26,500 applicants, and Columbia accepted 6.89 percent of the more than 33,500 students who applied. University of Pennsylvania admitted 3,785 students, for an admit rate of 12.1 percent while Yale’s acceptance rate was 6.7%. Consider the information Brown University lists on their website. Brown received applications from all 50 states, with California, New York, Massachusetts, New Jersey, and Texas as the most common. They also had applicants from 145 foreign countries (the most ever). The majority of all applicants intend to study social sciences (29%), life or medical sciences (27%), or physical sciences (25%), with biology, engineering, international relations, economics, biochemistry, and molecular biology as the most popular intended concentrations. Realize that if you are a member of one of these pools, you are competing against even more people than say, if you were an applied mathematics major from Iowa or North Dakota. This year’s applicant pool is the University’s most ethnically diverse, with 38 percent of applications submitted by students of color (African American, Latino, Native American or Asian). These students are all important to the institution, and the college admissions office will consider more than just grades and test scores when admitting a class. A child from a war-torn African country with lower standardized test scores may be selected over other candidates because of the diverse perspective he brings to campus. A talented ice hockey goalie keeps alumni engaged and involved, helps rally student spirit which in turn makes students happy and all of these help the overall institutional success. Harvard’s mid-50th percentile for SAT scores is 1410-1590 (Critical Reading and Math) out of a possible 1600. While 25% of enrolled freshmen have scores below and above this average, there are also loads of applicants with scores within this range who are not admitted. The majority of these students are probably perfectly capable of doing the work at Harvard, but there simply is not enough space to admit every qualified applicant. For every 100 spots, Harvard admits only six prospective freshmen(well, 5.6 really). Let’s say that upon initial review, 80 percent of applicants have standardized test scores and coursework rigorous enough to keep them in the running, yet 74 of them will get letters denying them admission. First, Harvard will look at the “buckets” that need students in them. Has the swim team filled all of its spots? Does the Department of Celtic Languages and Literature still have spots to fill? But when it comes to the more common majors, biology, international relations and the like, who does Harvard (et al) decide to take when they have a pool of applicants who are all academically qualified? Harvard then looks beyond grades and scores to see what else these students have to offer, and it’s here you realize the incredible talent and uniqueness of the students with whom you are competing for spots. These students have often been active politically on the national level. They have made a scientific discovery. They have started a business, played music professionally or started an international non-profit. They are Native Americans mentoring their fellow tribe members to go to college. They are the national or international presidents of youth groups (these are all true). For students who fall within the statistical averages of the Ivy League, but who still don’t gain acceptance, you didn’t get denied because of something you did wrong or because of something you were missing. Instead, there was someone else who helped fill an institutional priority or who has done something so unique and so extraordinary that they were almost unrivaled. Consider these students who did not receive a place at any of the Ivy League schools to which they applied. “J” is from a good suburban school district. She has taken numerous AP classes including 4 her senior year in high school. She has received 5’s on all of her AP exams. She is ranked first in her class and has test scores well within the averages at the Ivy’s. She is a two sport varsity athlete with substantial volunteer work and leadership. She got denied or waitlisted at every Ivy to which she applied. “C” is also from a good suburban high school. He has taken the most rigorous classes that his school has to offer and has earned A’s in all of them. His standardized test scores are very strong. He is a varsity athlete and has started his own non-profit which has collected used sporting goods equipment for kids who cannot afford their own. He is involved in many clubs and holds several leadership positions. He applied to 3 Ivy League schools and did not receive an offer of admission from any of them. What should you do with this information? Realize that the odds of getting into any of this country’s most selective colleges are quite remote. Try it, you don’t have a lot to lose, but be realistic. You should also know that none of the Ivy League schools give out academic merit scholarships. When every student is so well qualified, it becomes incredibly difficult who deserves merit money and who does not. As a result, the Ivies give out money ONLY based on financial need and NOT on merit. For some people, this may be a factor in your college search. The good news about the Ivies being so selective is that it makes that next tier of schools better. There are so many bright, capable, intellectually curious students who won’t be ivy bound that they enrich other institutions. I believe there are several schools that are ideal for each candidate and it is what you make of your college experience. In order to give yourself the optimum number of choices for college, have several people that you revere, review your college applications. College consultants help students stay on track with their college applications and find colleges that match their interests and strengths. Lone Star Ed Consulting offers essay and resume editing services, college selection assistance, and can provide rush services for a fee. Please download my registration form or email me at Lauren@lonestaredconsulting.com if you are interested in learning more about my educational consulting services. The information was provided by Lauren Kahn, CEO of Lone Star Ed Consulting. 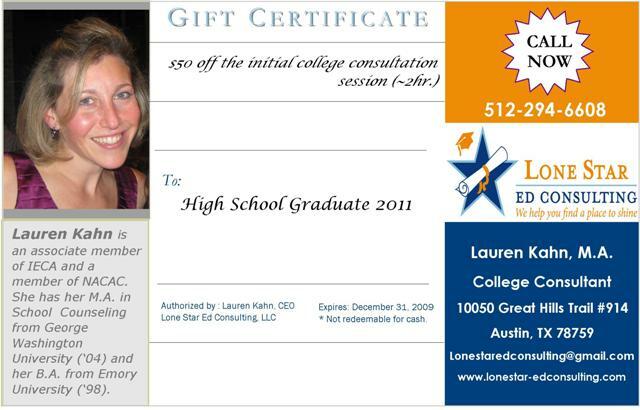 If you would like more information about Lone Star Ed Consulting's college planning services, please e-mail Lauren Kahn or call her at 512-294-6608. You can also view LSEDC's brochure here. Every spring, high school seniors anxiously await letters of college admission that will affirm and encourage their potential. In the movie, "Admission", which takes place at Princeton University, admissions officer Portia Nathan (Tina Fey) is a gatekeeper evaluating thousands of applicants. The movie touched me as a former admissions recruiter that spent nearly four travel seasons and umpteen days on the road traveling to find and collect the perfect class of students. Is there a formula to get in for every school? No, but are there the "shoulds" and "should not" things to put on resumes, recommendations, and the common application. There is the unwritten code. In addition, there are definitely protocols to follow for the alumni interview and cliche topics to avoid for admissions essays. As an admissions officer, I was never allowed to divulge the absolute truth about how we evaluated students in admissions. As a college consultant, I can help you navigate the daunting and sometimes unfair process of applying and gaining acceptance to college. It was bound to happen sooner or later. TCU has now added a binding early decision option and SMU has added a second early decision deadline. These universities want to know who is choosing them first and this binding option allows them to increase their confirmed yield rate for their incoming first year classes. Most likely, students will be somewhat rewarded for making that choice and will have an advantage in the admissions process if they apply early decision by the November 1st deadline. impact on applicants and those who advise them. apply for scholarships and admission online at www.applytexas.org. ApplyTexas opens August 1.
results that could benefit from superscore policies. (Lauren Kahn, educational consultant from Austin, TX, is particularly excited about the superscoring option, because students can really waiver in scores between sections and this gives them the best possible composite score). prompts recently announced by the CA. academic and extra-curricular activities might help you achieve your goals. I believe there are several schools that are ideal for each candidate and it is what you make of your college experience. In order to give yourself the optimum number of choices for college, have several people that you revere, review your college applications. As we enter the season of college acceptances from the regular decision pool, not far behind is the rush of juniors who realize it is time to concentrate on their upcoming college application process. In Texas, we have the ApplyTexas process which most Texas residents complete in order to gain acceptance to Texas A&M, Texas State, and / or the University of Texas system, among others. In addition, we also have what most people refer to as the foundation application, the Common App. It is a generic application filled out online by students that more than 300 universities accept. Recommenders are also very familiar with it as well. Of course, there are the supplements that must be submitted in addition. The Common Application has taken on many makeovers over the years, but this time it will actually be so simple that even those that are inept with technology can figure it out. Although the new updates won't take effect until August 1st, we can take a sneak peek now. Enter your email address: "College News From Texas"
How many collleges do you plan to apply to senior year? Buy college or school planning services today. Don't delay your child's educational journey to find their dream school. I am a college educational consultant that specializes in helping match high school students and their families with the colleges of their dreams. The purpose of this blog is to address some of the college admissions issues and help families understand how to get ahead in the college admissions game. If you would like more information about my educational consulting practice, please visit my website:www.lonestar-edconsulting.com or contact me at 512-294-6608 or lonestaredconsulting@gmail.com. I am an associate member of the following professional organizations:IECA and NACAC.